Bread club this morning was Potato Bread. 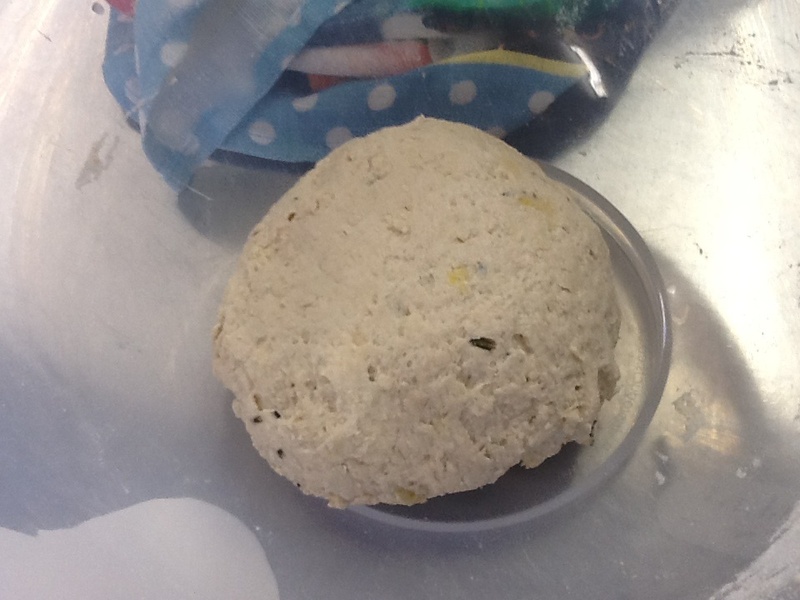 The afternoon group were doing Sourdough and I was so envious to see the starters brought by the teachers that when I got home I have begun again with attempt no 3 so fingers crossed! In the meantime the Potato Bread with rosemary and garlic was yummy so here’s the recipe. 2. Add the flour, oil, mashed potato, garlic and rosemary. Mix, making sure there is no dry flour left in the bottom of the bowl. Leave for ten minutes (or up to 30 minutes). Cover with a tea towel to prevent drying out. 3. Add the salt and “fold” the dough 30 times, leave to rest for 10 minutes. 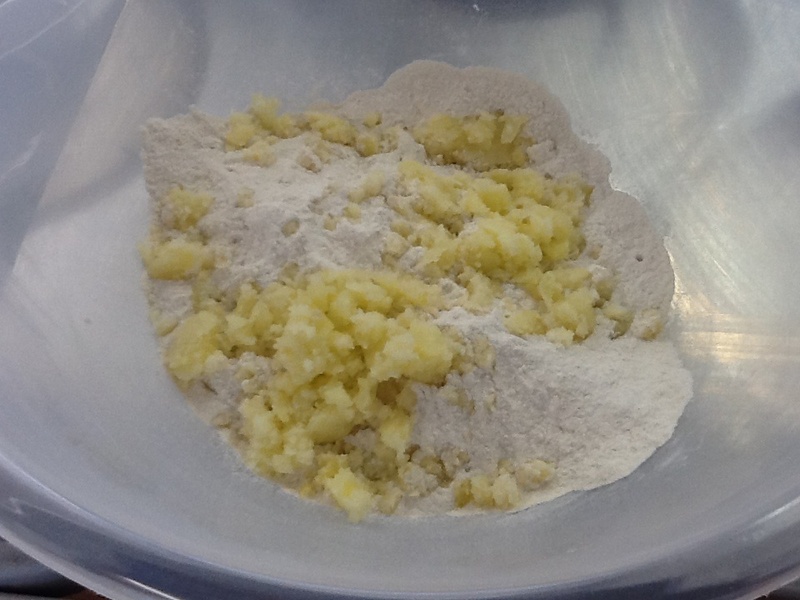 To begin with it will be very sticky do not be tempted to add more flour. 5. 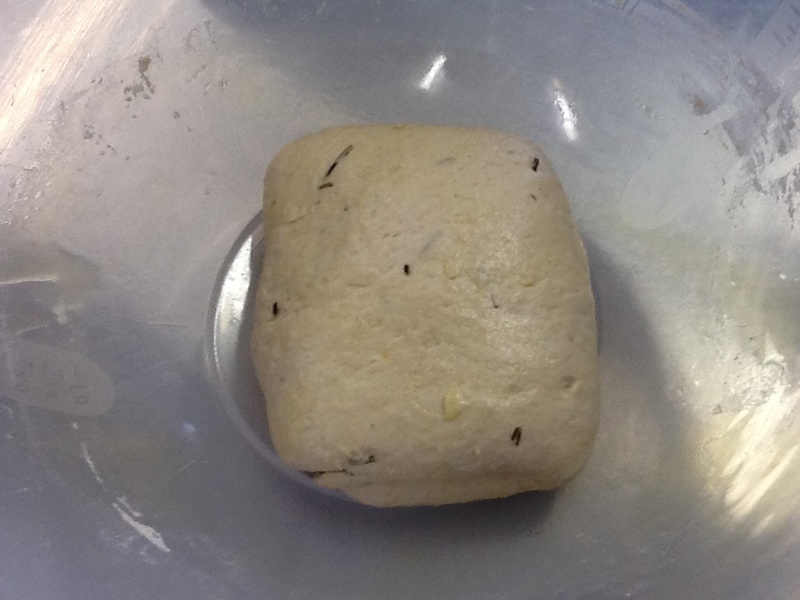 Place the dough on an oiled surface and stretch into a rectangle. Fold top third down and bottom third up. Turn 90 degrees and stretch and fold again. Leave, covered, for for 30-40 minutes. 6. Turn out the dough onto the oiled surface again – stretch and fold once then shape for your loaf tin – or as rolls which I did this time. 7. Cover with a tea towel and leave until risen – about an hour. 8. Bake in a preheated oven at 220 degrees for 30-35 minutes until golden and the base sounds hollow. If the loaf is browning too quickly cover with kitchen foil. 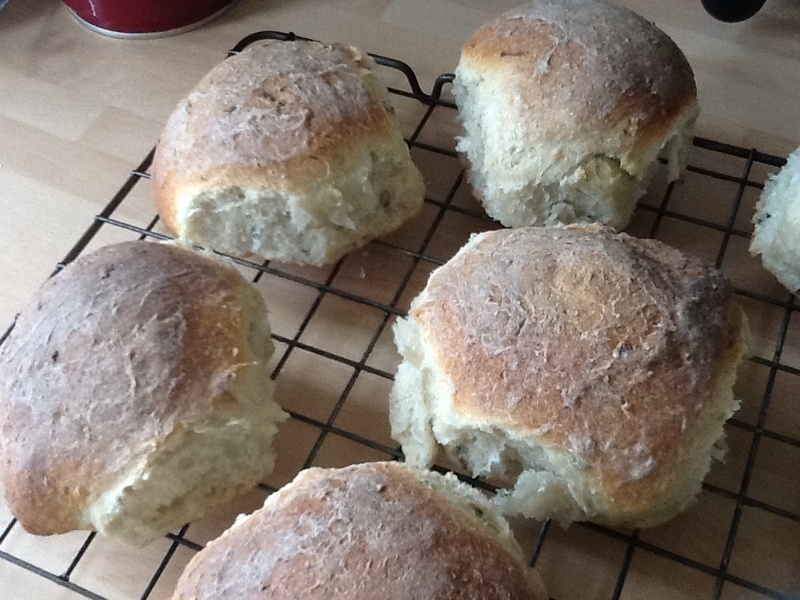 Thank you – I’m addicted to bread making at the moment! They look good. Question on the folding…do you fold 30 times each time or just first time? We fold 30 times leave 10 mins fold 30 leave 10 fold 30 leave 10 fold 30 leave for 30 mins. The folding is a pulling action pulling the dough from the top edge over the rest and turning the bowl as you go. Before leaving we flip it over so the smoother side is visible. I could never knead bread properly but this folding method suits me and seems to be successful. Perhaps I need to post a video at some point – it is the way Emmanuel Hadjiandreou demonstrates. Thank you for that explanation very helpful..will try the recipe. I have brought that bread from our local artisan bakers. Thank you – making leek and potato soup for supper they should go well together!